Everyone loves this dish. It takes a little patience and work, but it's worth it. The fastest way to do this is with two people: one handles the chicken and the other handles the other ingredients. One person can make this recipe but that person will need to continuously pause to wash hands to avoid contamination once you’ve handled chicken. When you have your four cutlets, lay them out on a cutting board. Top each with a slice of prosciutto, then a TBSP or so of cheese, then top with spinach. I like to put a lot of spinach in these, as when it cooks it melts down, so I stuff as much spinach in there as possible. Now start rolling the chicken like a jelly roll — as you roll, keep folding in as much spinach as you can. 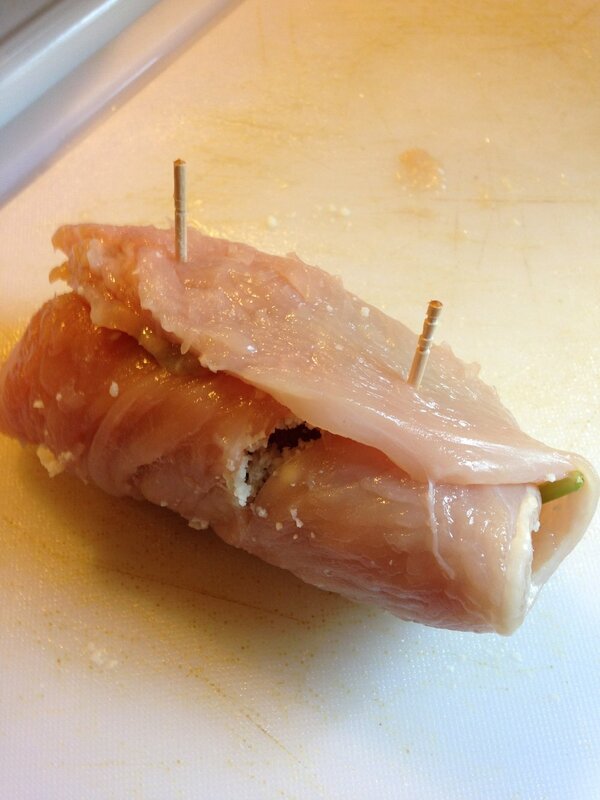 Once the chicken is rolled up, secure it with a couple of toothpicks. Heat some olive oil in a skillet and when the oil is hot use tongs to transfer the chicken to the pan. Sear the chicken on two or three sides to get a nice brown. In a hot pan this should happen pretty quickly. You want to get a good quick sear on each side, but not cook the chicken too long, lest you end up with a rubbery mess. Transfer the chicken to a baking dish and pop in the oven (I use a toaster oven to save on gas) and bake them at 350° for 5 minutes or so to finish cooking them. Now deglaze your skillet over low heat by tossing in some white wine, use a wooden spoon to get any brown bits off the bottom of the pan. Add half and half (you can use cream, but half and half is plenty rich), and the parmigiano, salt and pepper and cook over a low heat, stirring constantly, until the sauce thickens. Get your chicken out of the oven, pull out the toothpicks, put on a plate and spoon the sauce over. I like to top this with julienned basil leaves — to julienne just take 8-10 leaves or so, lay them flat on top of each other, roll them up like a jelly roll and slice — you’ll end up with perfect little strips of basil. This dish is great served with steamed spinach. For this dish I usually buy a very large container or organic baby spinach, use some to stuff the chicken and then toss the rest in a pan with a little water and steam until it’s cooked down. I then serve the spinach with the chicken — the spinach is also a great way to spoon up the extra sauce. Another nice side with this is grilled asparagus.